I have recently been trying to find the phrase that defines me and my philosophy about food in a general way. An online magazine (F-Magazine) wrote an article about me late in 2018 and lo and behold they nailed it. In part. "Through her approachable cooking style and effusive personality, Tenina has amassed a passionate community of home cooks and budding culinary mavens from Australia and beyond. 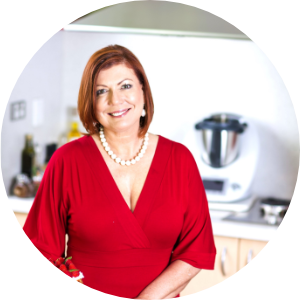 A champion for food positivity, Tenina is passionate about real food, delicious flavours and achievable results. Unafraid of of salt, butter or sugar, Tenina aims to inspire home cooks around the world to create and enjoy real food at home." I love this, it is true (though they missed chocolate part!) I hope inspiration is what you feel when you look through my stuff. That and some decent hunger! I have added healthy hedonism to the mix as well. I do believe in eating everything, just not ALL of it. In other words, have a cookie, not the entire batch. Enjoy the decadent cake, but just a slice or the scoop of amazing ice cream, but just the one scoop. Zero guilt served on the side. I am saddened by some popular dietary opinions that change often with social trends but seem to largely be very focussed with public self denial and using food as punishment to somehow demonstrate this idea as having a superior value, and making everyone who doesn't subscribe, feel guilty and less than if they don't join the bandwagon. I am pretty over it, if I'm honest. I think food needs to be about inclusion, about love, about family, about enjoyment, about life, about gathering, about health, about fun, and discovery. My passion for food has never waned. I am always seeking new ideas, tastes and methods. All with the view of passing what I learn on to you. I LOVE the reality that almost every cuisine has a donut recipe of some sort. Did you realise that?? Isn't that just fabulous? And why wouldn't they? There is nothing better than hot fluffy dough deep fried, what ever it is called or however it is served. Donuts are just one example. It fascinates me that we use similar ingredients in so many cuisines and yet the end results through cooking methods and traditions are vastly different. Bring it on. I want to know more and I hope you do too. I want to taste more. I want to experience more. I have continual food discontent! But all in the name of food positivity and definitely some healthy hedonism. So stay with me for the journey is no where near over. I have been doing this for years and I see no end in sight. May 2019 be full of great food, fun family events, and loads and loads of food positivity for you and all those you love!